Sweet pickle relish is the secret to these delicious Southern deviled eggs. Top the eggs off with a slice of pimiento and a little paprika or with slices of cornichon or piece of cooked bacon. The recipe is easily doubled for a party or potluck event. Place the eggs in a medium saucepan and cover with water. The water should come to about an inch above the eggs. Cover the pan and bring the water to a full rolling boil. Remove the pan from the heat and let stand, covered, for 16 to 18 minutes. Drain and then cover the eggs with ice cold water. When the eggs are thoroughly cooled, peel under cool running water. See some tips for peeling eggs, below. Slice 6 of the eggs in half, lengthwise. Put the remaining cooked egg in a bowl. Scoop out the yolks into the bowl and place the white halves in an egg dish or on a plate. To keep the white halves from rolling on a plate, slice a tiny piece off of the bottoms to give them a flat area. Or, line the plate with shredded lettuce. With a fork or small masher, mash the whole egg with the yolks. Add 3 tablespoons of mayonnaise, the mustard, relish, a dash of Tabasco, if using, and salt and pepper, to taste. Add more mayonnaise, if desired. Using a small spoon or small cookie scoop, fill the egg halves with the yolk mixture. Dust the eggs lightly with paprika. 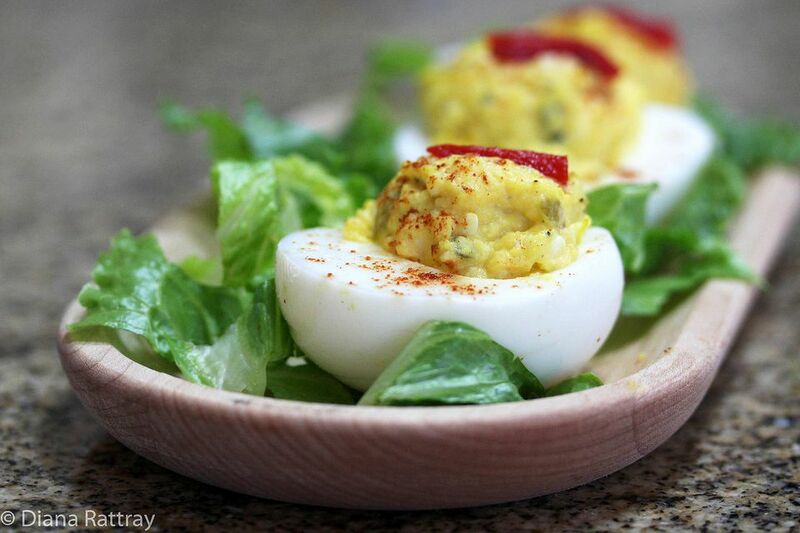 Top each deviled egg with a strip of pimiento or a slice of cornichon or sweet gherkin. Eggs nearer the expiration date will be easier to peel and will peel more cleanly. Let the eggs cool thoroughly before peeling. Crack the ends of the shell and then roll the egg on the counter, pressing gently with your hand, until it is cracked all over. Start peeling at the wide end, where there is a little air under the shell. Put an egg in a deep bowl or pan of cold water. If the egg stays on its side on the bottom of the container, it's very fresh. If the egg stands up and bobs on the bottom, it isn't as fresh. If the egg floats on the surface, it is old and should be discarded.